For some reason, I began wondering if there were fires around the world that burns continuously. Only then did I find out about eternal flames. Not the song by The Bangles, but real flames that keeps burning, naturally or deliberately. Off the top of my head, I would say that the eternal flames that are deliberately kept burning represent the continual burning of a cause, or a memory. It takes time, care and resources, and it represents the fact that we will never give up on the cause or memory that the fire is burning for. The first time I saw one of those lit was at the Episcopal Church that I attended in my youth. It was a candle that was always aflame. Of course the candle was replaced when it ran low. 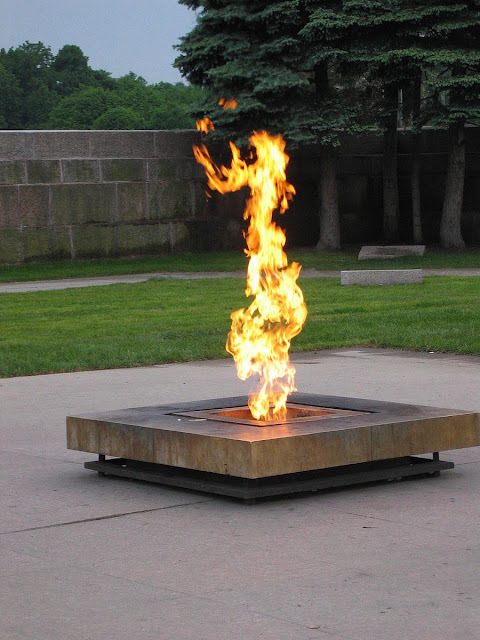 The second eternal flame was in 1963 when one was lit at the grave of President Kennedy. Nice...would love to visit one when I get the chance. There are none in my country. Wherefore art thou clean fresh air? Do you watch movies over and over again? Is there fairness is this world? What would it be like if there was no Jesus? Arggh...song stuck in my head!! !